Even though my husband and I went on our honeymoon to Italy almost two years ago, I still feel like it was yesterday. I wish it was yesterday. We loved everything about our two week trip. Visit Alyce with At Home With Books for more Saturday Snapshots. I love the panoramic view of these old buildings. Wish I was there too. Just gorgeous! I WILL make it to Italy one day! What a beautiful picture! Sunset, I guess? Love the colors and the old buildings. Love it!! I went to Rome in college and that picture brings back wonderful memories. What an experience that had to be. 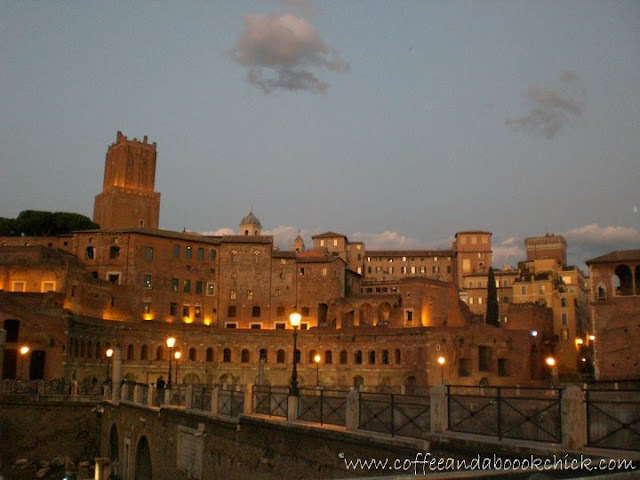 I have read so many books around Rome - I would LOVE to see it. That is the most lovely photo! Like Kathy, one day I will get there! Beautiful photo, and special memories for you, it's what makes photographs so fabulous. So lovely with the half light and the buildings lit up. That is a photo that just sparks the imagination! There's so much history there and so many lives lived - it makes me curious about them. We were in Rome for Christmas this year, on an extravagant family trip. What a treat -- no snow, just rain, but Rome at night is gorgeous, regardless of the weather. I'd love to go back!! That is an absolutely gorgeous picture! I've never been to Italy, but pictures like this one make me want to go. Would love to visit Rome!! Love the photo! Beautiful picture! I've never been to Rome but would love to visit. What a great low-light shot you got there! Simply lovely. Those building are just so beautiful and I love the wispy clouds in the sky. Perfect composition! That is stunning - I would love to go to Italy - maybe one day! Oh, so pretty! Me, too, on the "gotta go there, someday" remark. What a lovely shot and very romantic place for a honeymoon as well. Wonderful picture. You are making me miss it so much!! Ahhh, beautiful. I loved the architecture in Rome. I think I'll cry when I finally make it to Italy some day. Great photo. It almost looks magical. Well done. Thanks, everyone! The light in Italy makes everything that much more gorgeous, doesn't it? This photo makes me heave a happy sigh and makes me just a little relaxed. Just beautiful, thanks for sharing.